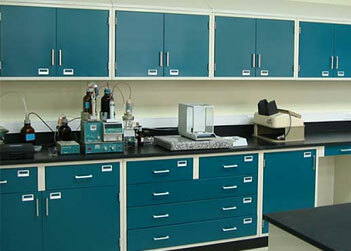 JHA Techspace offers a full range of steel laboratory casework and cabinetry. Our product solutions include a range of steel lab casework products of high quality and exceptional value. Base cabinets, wall cabinets, floor cabinets, as well as countertops and fixtures are offered in a variety of styles, dimensions and materials. Not every lab workspace calls for modularity and flexibility. When the traditional configurations of ‘built in’ lab casework are to be specified, contact us with your requirements. Standard dimensions shown. Custom designs and sizes available.